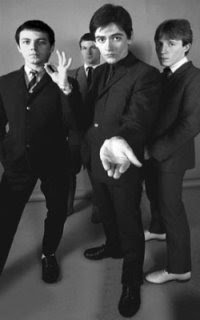 With the onset of the late 70's Mod revival, Ian Page of Secret Affair thought Mods needed a new name to identify themselves in a new era and came up with 'Glory Boys' stating that "It's a social comment for someone to be badly off and instead of glorying like the punks did, in having no propects, to do the complete opposite, to make a positive statement and say I'm entitled to anything there is in the world and I'll take whatever I can get." From their very first gig, opening for The Jam at Reading University in February 1979, the Secret Affair were adopted by a group of East End mods, who readily embraced Page’s Glory Boy concept. This group of fans began referring to themselves as Glory Boys, often tattooing the name on their arms or inner lips as a badge of allegiance. They were the unofficial security for the band. Secret Affair had become so closely linked to the emerging mod revival that in March 1979 Cairns wrote what would become the youth movement's main anthem, "Time For Action". Groups of Glory Boys would soon spring up throughout the country, such as the Sighthill Glory Boys of Glasgow. However, these 'Glory Boys' would in most cases describe themselves as Mods and the Glory Boy title was to be short lived. - Hey won't you give me a break - I'm going to be second to none." - Don't you know I'm a glory boy - I can cut you down by combing my hair." - If you want to know about us - You gotta be one too." Catch up with the Glory Boys themselves - Secret Affair are back and on tour now.